The Sole Fitness F63 folding treadmill is an extremely powerful machine that delivers the level of quality that we have come to expect from Sole Fitness. This treadmill is powered by a heavy duty 3.0 horsepower motor that allows for flawless functionality. It also comes with variable belt speed and incline, giving you even more power over your workout. All of this comes at an average price of $999.99, which is significantly lower than any similar models made by their competitors. 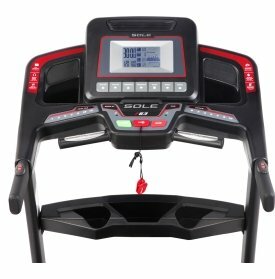 But is this machine really worth the purchase? Let’s find out. Many of the advantages of the Sole Fitness F63 lie in the machines raw power. The heavy duty motor that the F63 comes equipped with provides steady and smooth belt motion at the desired speed. 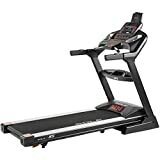 Speed options on this treadmill go up to 12 MPH, which can be combined with the incline of your choice up to 15 degrees. This system also uses a strong rack-and-pinion gear system, which delivers smooth and consistent belt movement. This is one of the most important aspects of any treadmill machine, which is unfortunately overlooked by many competitors offering similar products. Sole Fitness not only makes this a priority, but offers such a powerful machine in an easy to transport foldable design, making it easy to move into both homes and apartments. The Sole Fitness F63 also comes with a wide selection of exercise programs depending on the specific workout that is desired. The user can select the workout on the F63’s unique full digital display, which also indicates heart rate if the user is wearing the chest monitor. Of course, no workout would be complete without music, and Sole Fitness provides this element with build in MP3 compatible speakers. All of this combines together to make a very enjoyable and smooth exercise experience. While the Sole Fitness F63 has gained a lot of praise for its durability and dependability, it has gotten a few criticisms of itself. Most of these stem from the machine’s one touch digital interface and the selection of different speeds. Some users find that its 3 MPH increments in speed selection are too large of a difference and don’t offer the user full control of their workout. The only other complaint about this machine that seems prevalent is issues occurring with the heartbeat sensor. These issues are largely due to connectivity between the heartbeat sensor band and the machine and do not necessarily interfere with the machine’s functionality. Some users never encounter these issues, but it is important to note that flaws do occasionally show up in every product. Overall, Sole Fitness did not let anyone down with their F63 treadmill. This machine is one of the most well built treadmills on the market today, and possibly the best treadmill within its price range. This product offers users to choose which exercises they want to do and at the intensity they desire. The Sole Fitness F63 is also extremely durable and powerful, ensuring that as little problems will occur as possible and also removes many of the pains of maintained and repairs that would be experienced with other products. All of this comes in a unique foldable design, allowing for easy transportation and set up regardless of where you live. This product has many clear advantages with only a few drawbacks, making it a solid choice for anyone wishing to improve their personal fitness at home.